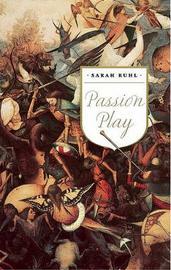 Named one of the "Ten Best Plays of 2008" by The New Yorker "Sarah Ruhl's bold, inventive, and ironic triptych [is] a meditation on devotion and its appropriation by the state. . . . Ruhl is an original; a storyteller with a fine mind evolving her own theatrical idiom." --John Lahr, The New Yorker "It's a different kind of morality play . . . an often wondrous work . . . with [Ruhl's] own special lyrical blend of poetry, humor and grace." --Frank Rizzo, Variety Passion Play is Sarah Ruhl's "biggest, most ambitious effort yet" (The New York Times), a three-and-a-half hour intimate epic, plunging the depths of the timely intersection of politics and religion. Ruhl dramatizes a community of players rehearsing their annual staging of the Easter Passion in three different eras: 1575 northern England, just before Queen Elizabeth outlaws the ritual; 1934 Oberammergua, Bavaria, as Hitler is rising to power; and Spearfish, South Dakota, from the time of Vietnam through Reagan's presidency. In each period, the players grapple in different ways with the transformative nature of art, and politics are never far in the background, as Queen Elizabeth, Hitler, and Reagan each appear, played by a single commanding actor. Sarah Ruhl's plays include Dead Man's Cell Phone, Eurydice, and The Clean House, which was nominated for the Pulitzer Prize. Her work has been widely produced both throughout the country and internationally, and she is the recipient of the MacArthur "Genius" Fellowship.